The cryptocurrency market is booming, with hundreds of thousands of new traders are entering the fray due to Bitcoin’s historic Q4 2017 run. It’s no secret that cryptocurrency investing is a high-profit endeavour, but the rapidly-growing cryptocurrency market is an extremely risky environment for traders that don’t take security seriously. The immutable nature of distributed ledger technology means that once cryptocurrency transactions occur, they can’t be reversed. While this is a major draw of cryptocurrency, it can become troublesome for users that don’t maintain a proactive stance towards security. A cryptocurrency wallet consists of two elements— a public address and a private key. The private key of a cryptocurrency wallet is all that is needed to access the capital it contains. If your private key becomes compromised, then it’s time to say “sayonara” to all of your Bitcoin— or whatever cryptocurrency the wallet holds. 2 What is the Ledger Nano S? 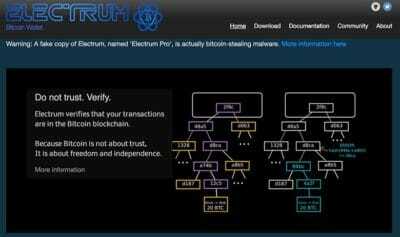 There are now thousands of different scams, hacking attempts, phishing websites, and other malicious attacks that attempt to separate unsuspecting investors from their cryptocurrency. Never assume that your cryptocurrency is safe— especially not if it’s held in a hosted wallet, such as an exchange or a brokerage like Coinbase. There have been many high-profile exchange hacks that have resulted in the loss of hundreds of millions of dollars worth of cryptocurrencies, such as the infamous Mt. Gox hack or the DAO hack. More recently, Japanese exchange Coincheck was hacked to the tune of over $500 million. Users that hold cryptocurrency in “hot” or hosted wallets place their investment at the mercy of the security practices of the platform that holds it for them. In many cases, it is inefficient. The best way to manage your cryptocurrency and eliminate the threat of exchange hacks and other security threats is to use a “cold” wallet that is completely disconnected from the internet. There are many that can be installed on both computers and smartphones, giving users control over their private keys. While this solution is a good way to prevent losses from hot wallet hacks, it doesn’t eliminate the threat of a malicious party gaining access to your device. The most secure method of storing cryptocurrency is with a hardware wallet. These solutions are designed from the ground up to function as completely independent physical devices built solely for secure cryptocurrency storage and are completely immune to hacking attacks. Cryptocurrency is a powerful tool, as it puts complete control over your currency into your own hands— but many traders and investors forget that this includes security as well as storage. This hardware gadget can be considered a “bank vault for crypto”, and makes it possible to store your cryptocurrency offline in a small device roughly the size of a USB drive. As a hardware wallet, the Ledger Nano S is designed to securely store the private keys that are used to access a wallet. The Ledger Nano S stores the private key of a wallet and never exposes it— not even to the computer that is used to access it. 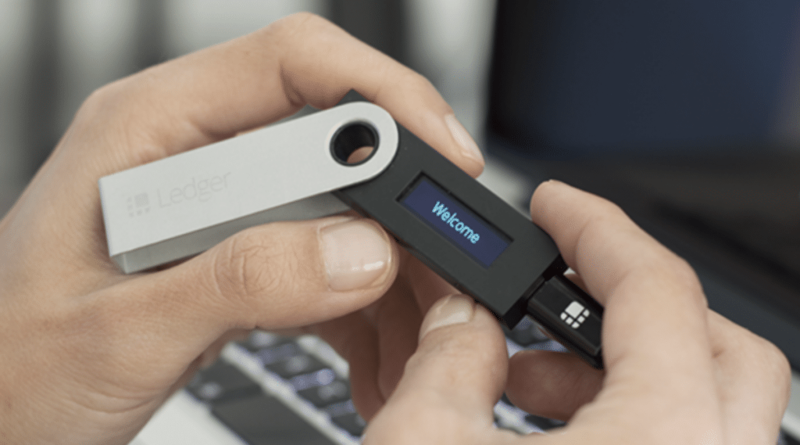 Ledger, the company that manufactures the Nano S, was founded in France in 2014 and has rapidly developed a reputation as a creator of highly secure, reliable cryptocurrency storage devices. Public opinion of the gadget is extremely positive. It is a small device equipped with an OLED display that is used when interacting with the device, as well as physical buttons that add an extra layer of security when transferring funds. It is extremely easy to set up and use, which is appealing to newer cryptocurrency investors and supports a wide range of cryptocurrencies. The only drawback to this wallet is that in order to store cryptocurrency you’ll need to download and install a specific app for each token. As it has limited onboard space, it’s only possible to install two or three of these apps at a time. Investors seeking streamlined support for a diverse range of altcoins are likely better off with another option, such as the Trezor. 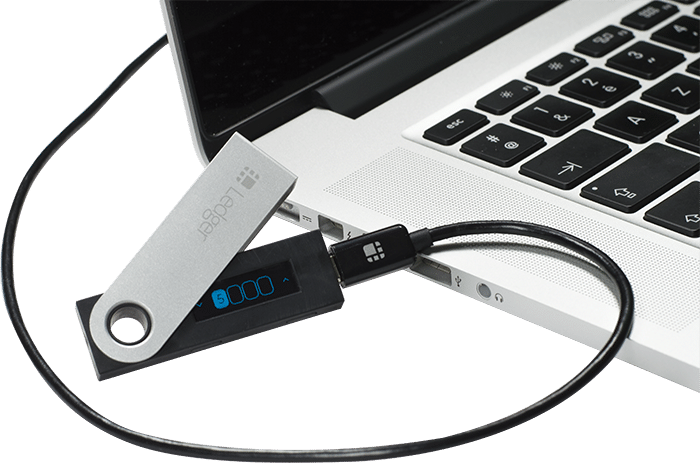 Crypto investors and traders seeking highly secure support for high market cap cryptos such as Ethereum or Bitcoin, however, will find the Ledger Nano S ideal for their security needs. The company ships it with a security-sealed wrapped pack. Some other devices, such as the Trezor, ship with a security seal, but as the Nano S possesses built-in anti-tamper software that will alert a user if it has been tampered with during shipping, Ledger offers a greater level of supply chain security. It’s extremely important to ensure that you either purchase a Ledger Nano S directly from Ledger or from a reputable Amazon seller. Never purchase a second-hand hardware wallet, as it’s highly likely the device has been tampered with. In the box, you’ll find the device itself, a USB cable, a keychain, lanyard, an instruction card, and a recovery card. The packaging itself is decidedly minimalist and is similar in design to Apple products. The Ledger boasts an extremely fluid user experience. Setting it up is extremely simple— we’ll provide a basic rundown on this process deeper into this review. It works in a similar manner to most hardware wallets available on the market today and can be set up in just 2 to 3 minutes. After setting the Nano S up, users will need to install an application for the specific cryptocurrency they want to store on their device. It’s also necessary to install PC software in order to transfer cryptocurrency to the wallet. 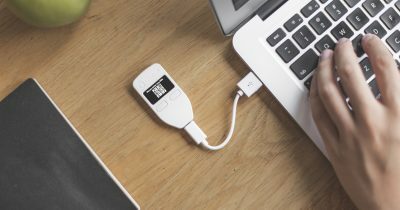 Ledger provides a chrome extension and other solutions for this purpose, but it’s also possible to use a range of different third-party wallets that are designed to integrate with the Nano S, like MyEtherWallet. The Ledger Nano S can be used to send and receive payments, check account details, and manage multiple wallet addresses. The Chrome extension makes Nano S management streamlined and intuitive and doesn’t require the extensive study of instructions to understand. Overall, it is arguably the easiest to use hardware wallet on the market. It boasts a robust design. Each Nano S looks and feels similar to a USB drive, albeit, with a little more weight and a built-in screen, it is protected by a steel housing that swivels on a mount, protecting itself from scratches and bumps. It fits easily into a palm or onto a keychain, but if you’re not in the habit of storing vast amounts of cryptocurrency capital next to your car keys, it’s best to keep your Ledger Nano S locked up somewhere secure. Each Nano S is equipped with two hardware buttons, which are used to confirm transactions and operate the device without a PC. Overall, it is one of the best-looking and sleekest wallets on the market, second only to the Ledger Blue, Ledger’s premium wallet solution. Its altcoins support is also strong and can be easily added via the app functionality. It provides support for a number of coins that can be difficult to store on other devices. Ledger Nano S Neo support, Bitcoin Gold support and Bitcoin Cash support is highly functional and easy to set up. The Ripple wallet app and Monero wallets are also extremely intuitive. As security is the main draw of this hardware wallet, it’s important to understand exactly how it keeps your cryptocurrency investment safe. When setting up the device, users will be required to choose a PIN. This PIN is used to secure the device in case it becomes lost – after three incorrect PIN entries, it will wipe itself. This may be cause for concern— placing a million-dollar crypto investment at the mercy of a few incorrect PIN entries is definitely alarming— but fortunately, it uses a 24-word “recovery phrase” that can be used to regain access to the wallet should it ever be lost or destroyed. Users are supplied with this 24-word phrase when setting the device up for the first time and are prompted to store it on paper to eliminate the risk of it falling into the wrong hands. For those interested in a fireproof, waterproof, shockproof, almost indestructible method of storing recovery phases there is also the very cool Cryptosteel solution. In order to approve transactions, users of the Ledger Nano S must press two physical buttons at the same time, ensuring that no hacker could ever gain access to it and confirm a payment without being physically present. The screen provides an extra layer of verification when sending payments, making it easy to ensure that the payment you’re sending is the right amount and to the right address. Ledger, the manufacturer, has a strong reputation in the cryptocurrency industry. Importantly, the Nano S is completely open-source, which means it’s been vetted by the extremely stringent cryptocurrency community at large. It also lacks a battery or any kind of radio communication characteristics ensuring that when it’s disconnected from a computer it’s completely inert, offline, and unhackable. The company has also recently released a highly innovative new security feature called “plausible deniability”. This feature is intended to provide another layer of safety to users that face the threat of physical coercion to give their PIN code. These kinds of robberies are becoming more frequent, and have recently occurred in both the UK and Thailand. The plausible deniability feature provides users with the ability to set two different PINs. The first provides access to the main wallet of the device, while the second provides access to a hidden wallet that is used for large savings. In the event a user is forced to reveal their PIN, they are able to provide the PIN to the smaller account, protecting their cryptocurrency holdings and wellbeing. At a later date, users can simply restore their wallet— and the larger amount of their capital— with the seed phrase. Setting up the Ledger Nano S is relatively simple and can be achieved in just a few minutes. We’ll now run through the setup process involved in getting started with it. In order to set up, you’ll need to plug it into a computer via the provided USB cable and turn it on which will then direct your browser to a URL with some basic guidance on how to start. The first step in starting the Nano S is to establish a four-digit PIN code. This is configured on the device itself using the two physical buttons on the side. The left or right button will move the number selection up or down respectively while pressing both buttons at the same time will lock in your choice and allow you to move to the next number. Don’t forget this PIN! 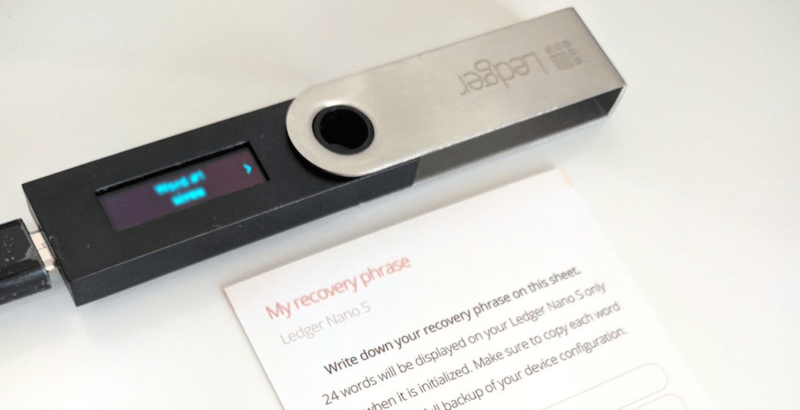 Without it, you won’t be able to use any of the functions of the Ledger Nano S.
Once you’ve chosen and locked in your PIN, your device will provide you with your 24-word recovery phrase. Write them down on the card provided in the Ledger Nano S packaging, and don’t lose them. These words are critical if your wallet is lost or stolen. After you’ve recorded your recovery seed phrase, it will test four of the words back with you and you’ll need to confirm these words with the device to be able to move on to the next step. After you’ve performed this quick set up process, you’ll be provided with the message “Your Device is Now Ready”. The easiest way to interact with your Ledger Nano S is to install the Ledger Chrome browser add-on. The URL which you have been directed to upon launch will provide you with the links needed to install these apps, beginning with the Ledger Manager. This app is then used to install the various Ledger Nano S apps used to store cryptocurrency on the device. The wallet can generally support up to five different apps at one time. 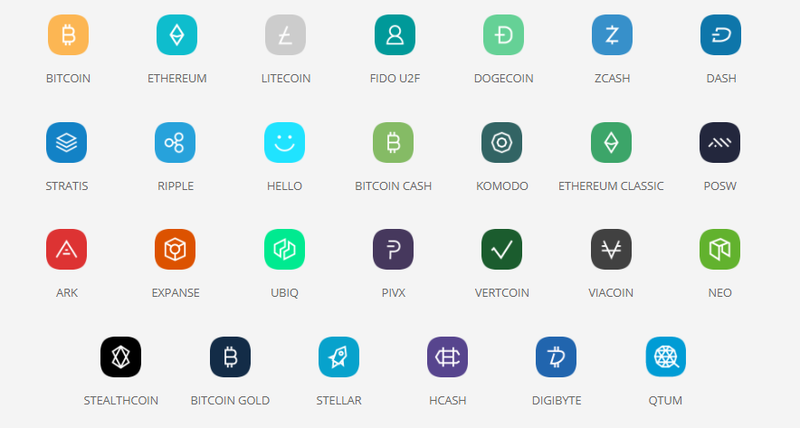 Using the Ledger Manager app, select the relevant apps to the cryptocurrencies you wish to store and click the green download button next to each. Ledger provides three different Chrome browser apps for Bitcoin, Ripple, and Ethereum. The Bitcoin app, for example, is extremely easy to install and use. Once you’ve installed the Ledger Bitcoin Chrome app, you’ll need to run it and enter your PIN code into your device. After this step, you’ll be able to create a Bitcoin address. 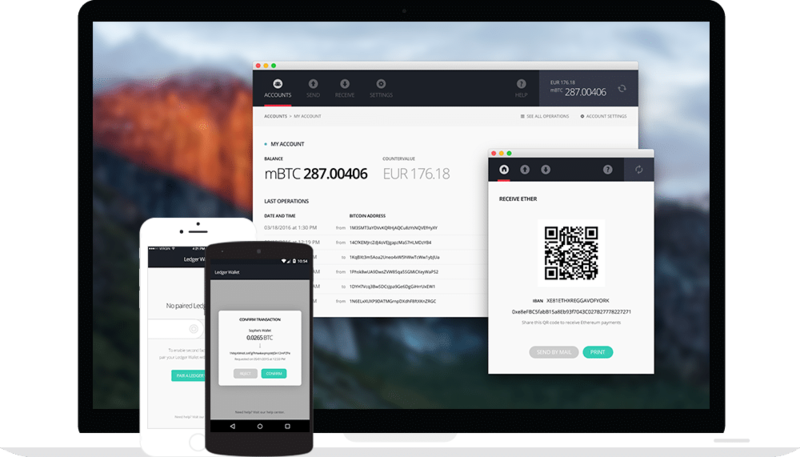 From here sending and receiving BTC to your Ledger Nano S is relatively simple, with the app providing users with QR codes for streamlined transactions. 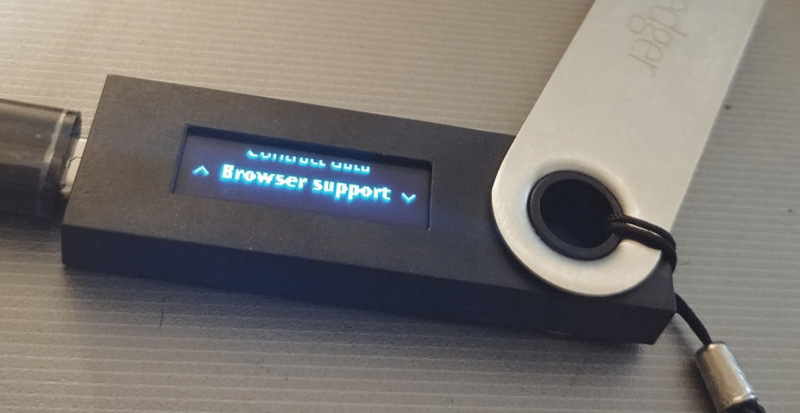 The Ledger Ethereum Chrome app is suitable for simple use, but it’s generally regarded as a better option to use MyEtherWallet to transfer Ethereum to the Ledger Nano S wallet. The MyEtherWallet solution, which has recently forked into MyEtherWallet and MyCrypto, is a powerful, secure, and free application that can be used to store and manage both Ethereum and ERC20 standard tokens. Sending or receiving transactions from MyEtherWallet or MyCrypto is extremely simple, but requires an additional step in order to allow browser-based transactions from these sources to access the device. Enabling browser support is necessary in order for it to work with MyEtherWallet, MyCrypto, Copay, or Greenaddress. To enable it, connect your Nano S and scroll with the right button to find the “settings” menu. Once you’ve found the settings menu, press both buttons at the same time to open it. Scroll again with the right button until you find “browser support”. Enable it by pressing both buttons at the same time. Note that in order to use your Ledger Nano S with the Ledger Wallet application, Electrum, or Mycelium, you’ll need to disable browser support. Should you lose your Ledger Nano S, don’t worry too much! It’s possible to recover everything it contains if you still retain your 24-word seed phrase. The easiest way to restore is with a replacement Nano S during the setup process. When setting up your new Ledger Nano S, it’s possible to select the “Restore Configuration” option. At this point, you’ll need to create a new PIN, which is mandatory. After completing this step, you’ll need to select the number of words in your recovery phrase. At this point, it’s necessary to enter your recovery phrase. This step is performed word by word, letter by letter, using the two physical buttons on the device. Although this process is time-consuming and frustrating, it’s a small price to pay to retrieve the contents of your wallet. If you’ve entered the phrase correctly you’ll be presented with a success notification, at which point your device is completely restored. 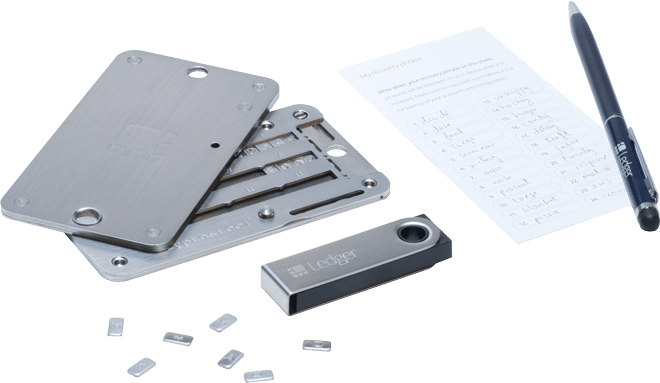 Overall, the Ledger Nano S is the ideal hardware wallet solution for beginner, intermediate, and even advanced cryptocurrency investors. It is tough, streamlined, and low-profile, and ensures that all cryptocurrency stored on it is completely safe from hackers and other malicious parties. While it may appear to be counterintuitive to place all of your eggs in one basket, it keeps your private keys secure— even from you— and allows users to restore their devices via the seed phrase recovery method. The new plausible deniability feature is a massive draw to those concerned about the threat of physical intimidation into divulging their hardware wallet PIN. Ledger provides ongoing updates and support for its users to ensure they are kept up with the latest market and technological developments in the blockchain world and consistently adds new, innovative features. If you’re looking for the most secure method of storing your cryptocurrency the Ledger Nano S is one of the best options available. Use this link to purchase directly from their official site. Previous article Bittrex Review & Guide – Is it a Legit Exchange in 2019? Next article What is NEO (and GAS) and how does it work?